There’s been many questions about our design choices this year in the pits and on CD. We’ve put this document together to help explain some of our design decisions. Enjoy. thank you so much for that! I now understand a bit more of how your amazing robot works! that’s great! Is there any chance of a real picture of that winch in its 2 positions? Simple, effective, elegant… it’s just what we’ve come to expect from 1114. 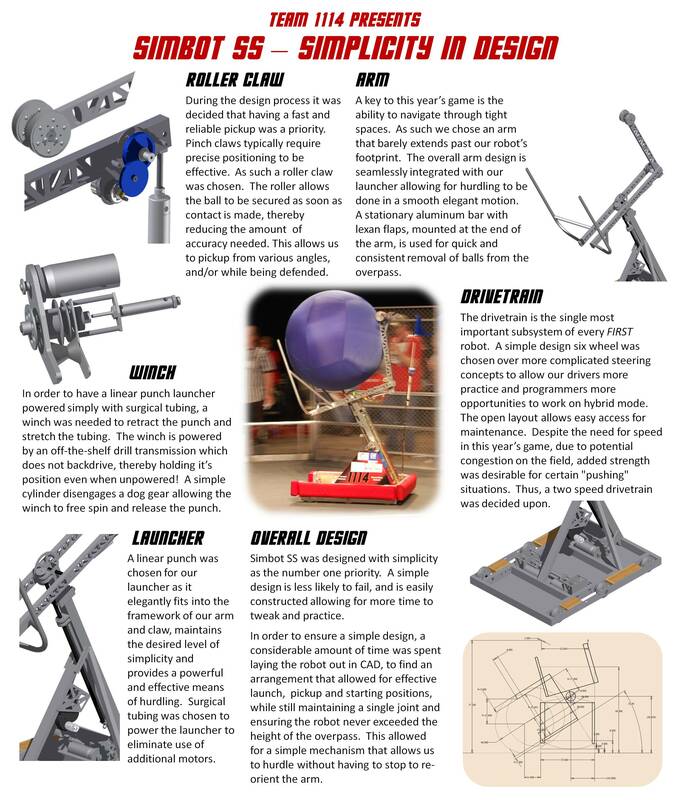 Awesome robot, Simbotics. Thanks for posting this. BTW, I sure hope we get to compete with you rather than against you! A wonderful presentation of the robot! The write-up & picture layout and arrangement is great. Wow! You guys used the Fisher Price gearbox! Thanks for posting this informative poster! If nothing else, now you can point to it when people ask questions. The pickup reminds me of fvc1114 last year. One question, does the top of the arm, with the rollerclaw elevate or change position when the ball is fired? I’d guess it changes the position of their arm…from pickup to launch. Yup, the arm section with the roller opens slightly using a cylinder. This allows the ball to fired freely. The Fisher Price gearbox is used for the rotation of the arm joint. The gearbox is chained up to a 72 tooth aluminum sprocket. We used the stock gearbox, but made some modifications to increase the robustness and reliability. SS definitely is a work of “mechanical simplicity genius.” - however in the past we have seen this from 1114 but never the “Title” . I personally feel team 1114 is the picture perfect team for displaying GP- . Don’t forget the bullseyes on your backs - thats the only thing missing from your design. Remember when your on the top everyone wants to knock you down.-after all thats the only Graciously professional thing to do. That why we’re all here. You may have to play a bit harder hit a bit harder , forgo a hurdle so you alliance can take one - but I know this is the year. I’ll be watching your every match with baited breath. IF we had thought of it. To be perfectly honest, this year’s game is one of the simplest in the past five years in many ways. It seems appropriate, therefore, that a robot that expemplifies elegant simplicity is leading the pack heading in to Atlanta. I hope I get the chance to cheer for you on Saturday afternoon on Einstein, this is a Championship whose time has come! This is one of the most helpful and inspiring things i have seen a team do this year. And someone asked where all the GP went! thank you. Wait… You only used two motors in the drive? :eek: But how come it goes so fast? And how’d you get it to turn with six traction wheels? Our robot is probably geared lower, and our acceleration is horrible. We also couldn’t turn with six traction wheels. We had to replace two of them with casters. I spy four drive motors, and they probably dropped the center wheel a smidgen or two. 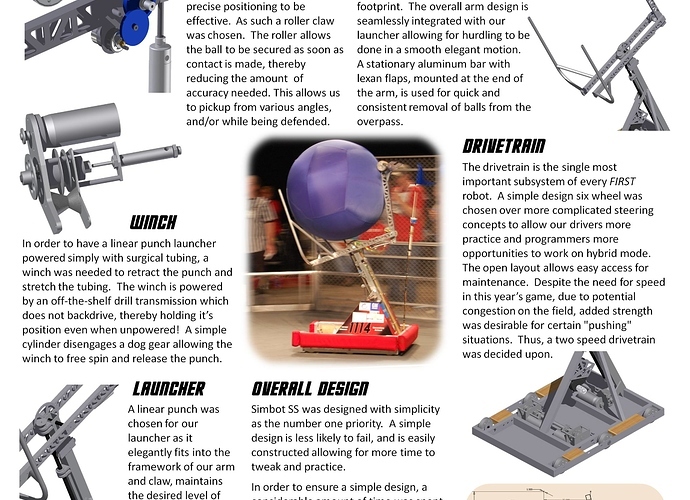 Nice work posting the workings of the basic components of your robot, that’s sure to answer a ton of questions! It really is an awesome design, you guys know how to build robots. Ahh… you need to head back east for a couple competitions and play these guys. It is a little known fact that Team 1114 is actually “General Motors Canada and Hogwarts Academy” The whole Niagara FIRST thing is just a cover to keep the magic arts concealed from us muggles. As for the GP… yeah… we played them three times at last year’s GTR, and probably once or twice in years before that. These guys are a class act when they win… and even in the extremely rare instances where they don’t. I don’t know how many teams are putting forward strong bids for a Championship AND a Chairman’s in Atlanta, but 1114 is definitely one. That was my guess. You can clearly hear it even on webcast matches when your arm rotated. Must be pretty loud. By the way, how did you get the 72 tooth sprocket? Go-Kart type? We used an 84 tooth last year and 72 this year and that’s the most common question we get about our robot. I’ll say it: 1114 is serious business. It was a custom job, machined out of aluminium on their CNC.